Der Artikel Gipsy Kings: Roots wurde in den Warenkorb gelegt. 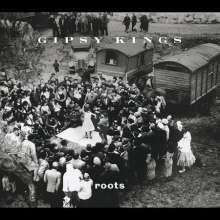 In the summer of 2003, the core members of the Gipsy Kings—the singers and guitarists of the Reyes and Baliardo families — settled into a stone villa in the small town of St-Andre-de-Bueges in the south of France, where they collaborated with producer Craig Street on Roots, their 2004 acoustic album. For the first time in years, the band recorded without a drum kit, synthesizer, or electric bass, bringing the music closer to its Flamenco origins. As artists born and raised in the Mediterranean musical tradition of cante jondo, the Gipsy Kings are among the truest and best-known exponents of this centuries-old form. Roots features Nicolas, Canut, Andre, Patchai, and Paul Reyes, as well as Tonino, Diego, and Paco Baliardo. Double-bassist Greg Cohen—known for his work with Tom Waits, Marisa Monte, and Dave Douglas—joined them. Percussionist Cyro Baptista and accordionist Garth Hudson, formerly of The Band, also play on the record. In the band’s first acoustic outing since 1990s Allegria, the Gipsy Kings worked with American producer Craig Street, who is acclaimed for his work with such well-known artists as Cassandra Wilson and Susana Baca, and who was among the four producers to collect Grammys for Norah Jones’s multi-platinum debut. Street joined the band near the town of St-Andre-de-Bueges in France’s Languedoc region, where they took over a 17th-century farmhouse and turned an old storeroom into a makeshift studio. The unique location—in the Gipsy Kings’ home region, surrounded by their culture’s social traditions—contributed greatly to the authentic, stripped-down style of the record. Over the years, the Gipsy Kings—who hail from the gypsy settlements in Arles and Montpelier in the south of France—have included singers and guitarists from the Reyes and Baliardo families. Lead singer Nicolas Reyes is the son of famed Flamenco singer José Reyes, who, with his cousin, guitarist Manitas de Plata, sold millions of records in the 1960s and '70s. The band’s vigorous guitar work and passionate vocals are the trademark of an indigenous musical tradition known as rumba flamenca. The Gipsy Kings particular style reveals the influence of Paco de Lucia’s nuevo flamenco, as well as singers Cameron de la Isla and Manolo Caracol. The best-selling French band in history, the Gipsy Kings are among the best-known non-English speaking groups in the US (the band’s language is the Gypsy dialect of gitane). Since the 1987 release of the international hit single “Bamboleo,” the Gipsy Kings have sold more than 14 million albums worldwide—more than four million in the United States alone.